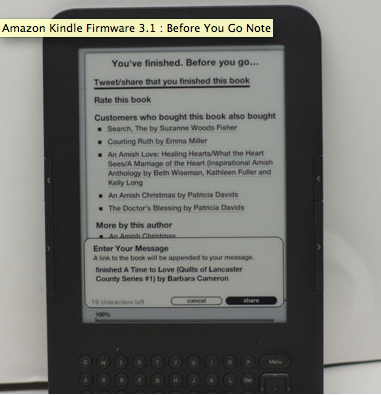 The latest generation Kindle now brings up a Before You Go… screen on the last page of all books, which can be a great way of spreading the word about your book through social media, as well as garnering reviews on Amazon.com. That’s two fantastic promotional opportunities! Unsure what ‘latest generation’ means? 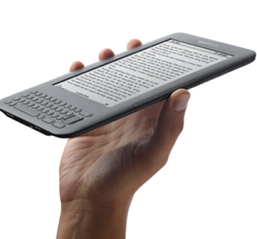 See this page for images of the different Kindle generations to see what yours is! The Before You Go… feature invites the reader to share with their Twitter and Facebook followers/ friends that they’ve finished the book. They are also able to give it a rating and write an Amazon review. The page also links to other titles by the same author, as well as a list of books that “Customers who bought this book also bought…”. This is great news for authors with more than one title. 1. Before You Go is a built-in feature and it’s only built into the latest generation. Neither the Kindle owner nor the book publisher has to turn it on, it’s naturally there. 2. Readers do need to enter their Twitter and Facebook account details into their Kindle in order to share what they have read. 3. The only real thing you need to know as a publisher: the Before You Go… page is a very useful way of getting reviews on the spot since many people will forget to write them later. And as we all know reviews drive sales. So you want as many people as possible to see this page. What you do not want therefore is a ton of backmatter between the last word of your book and before the Before You Go screen. When formatting your book, be sure to make sure the Before You Go screen comes soon after the book finishes. Traditionally there might be acknowledgements, references, book club questions and prompts after the last word. I would argue that it is more important to have readers see this screen than include this information. Important acknowledgements (brief ones at least) can come at the beginning of the book, and other information can be found on your website, which you can leave a link to at the end of the book. The only backmatter exception I can see worth having, is a chapter excerpt for another of your titles at the end of your book. If readers enjoyed the book they just finished they will most likely want to read your excerpt and be drawn into your other title this way. What are your thoughts and experiences with the Before You Go… screen? How will you handle not leaving the traditional pages and pages of acknowledgements? Do you think that spreading the word through social media in this instance drives sales?